Some of the most promising and successful startups to come out of New Brunswick in recent years have emerged out of the Technology Management & Entrepreneurship (TME) program at the University of New Brunswick – companies like SmartSkin Technologies, Go-Go Gymnastics, Resson Aerospace, HotSpot Merchant Solutions, SimpTek Technologies, and Castaway Golf Technologies. The program’s annual pitch competition has been a central force in propelling students’ innovative ideas into companies. 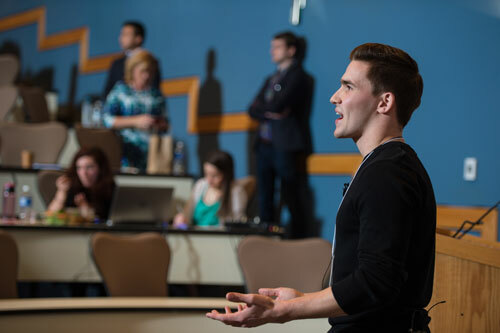 Some 70 students stepped forward to pitch their ideas at the most recent competition earlier this month at the Wu Conference Centre at UNB. “To see 70 students step up to pitch their ideas this year is indicative of the outstanding entrepreneurial spirit at UNB,” says Calvin Milbury, CEO of the New Brunswick Innovation Foundation (NBIF). The foundation has sponsored the event since its inception in 2007. This year’s competition featured 30 pitches. Thirteen prizes, with a total value of $9,100, were awarded. Among the prize-winning ideas are an app to find you a licenced taxi, a new way to capture and store tidal energy and an app to link you with nearby partners for athletic pursuits. Sponsors included the Engineering Endowment Fund at UNB, Cox & Palmer, NBIF, the Financial and Consumer Services Commission of New Brunswick, the Pond-Deshpande Centre at UNB, the International Business & Entrepreneurship Centre at UNB, Innovatia, and J.D. Irving, Limited. “The entrepreneurship support network in New Brunswick has come such a long way in the last few years,” says Dr. Dhirendra Shukla, J. Herbert Smith/ACOA Chair for Technology Management and Entrepreneurship at UNB. Matthew Power of Clarenville, N.L. ; Chemical Engineering / Technology Management & Entrepreneurship. CarCue provides vehicle users with a means of tracking upcoming and historical maintenance activities while connecting them to local maintenance shops to offer discounts for their upcoming maintenance needs. Sebastian Andrews of Saskatoon; Civil Engineering / Technology Management & Entrepreneurship. HeyTaxi is the solution to connect technology minded consumers with licenced and regulated local taxi companies in a single tap. It's an ad-powered taxi aggregation service, giving taxi companies the convenience of Uber, keeping their prices competitive, and providing consumers with the most time- and cost-effective drive home in a licenced vehicle. Nicholas Poirier of Dalhousie Junction, N.B. ; Mechanical Engineering / Technology Management & Entrepreneurship. TracShoe is developing footwear with retractable crampons, allowing for reduced risk of falling on ice or snow without the hassle and mess of installing removable crampons to your boots. Sébastien Haché of Shippagan, N.B, Civil Engineering / Technology Management & Entrepreneurship. Ludo is an app that connects athletes with potential partners in their current area, based on skill level, location, and venue accessibility, increasing both competitive enjoyment of the individuals and facility rentals and usage at local sporting centres. Grace Bowness of Summerside, PEI; Chemical Engineering / Technology Management & Entrepreneurship. The BagelBot is a breakfast solution for busy mornings, allowing users to have the convenience of a perfectly prepared bagel in the comfort of their own home, without the added cost of having it prepared for them. Cameron Arsenault of Summerside, PEI; Geodesy and Geomatics Engineering / Technology Management & Entrepreneurship. CanCross is designing new temporary bridges that can be installed with ease and will allow for heavy transportation on roadways with deteriorating culverts. Limbic - First place ($1,000 plus legal services from Cox & Palmer). Alex Matson, Fredericton; Mechanical Engineering / Technology Management & Entrepreneurship. Limbic is revolutionizing the electric longboard, using body motion to control this type of sporting gear. Sarah Gowan, Rothesay, N.B. ; Masters in Chemical Engineering / Technology Management & Entrepreneurship. Surt is using nanotechnology to improve the safety of emergency responder equipment such as face shields for firefighters that can withstand higher temperatures. Emmanuel Albert of Dubai, UAE; Masters in Technology Management & Entrepreneurship. Trispectra Innovation Inc. is developing an integrated communications platform that uses sensors, wireless transmitters, and software to assist utilities companies in speeding up power restoration after a power outage. Samuel Mason of New Durham, N.H.; Electrical Engineering / Technology Management & Entrepreneurship. CarboGlove is creating heated, disposable gloves for emergency responders to wear in cold climates. Scott Shreenan of Lower Sackville, N.S. ; Masters in Technology Management & Entrepreneurship. Rising Tide Technologies is developing a technology that will use the forces of the tide in a novel method to capture the mechanical energy, allow for its storage, and use it to generate electricity during peak demand, helping utility companies to manage the energy demand fluctuations that occur throughout the day.